Hi everyone! We are kicking off the beginning of fall with this amazing scratch Caramel Cake with Caramel Frosting! Fall never fails to boost my cravings for all things caramel, pumpkin, or spiced. This Carmel Cake is no exception! 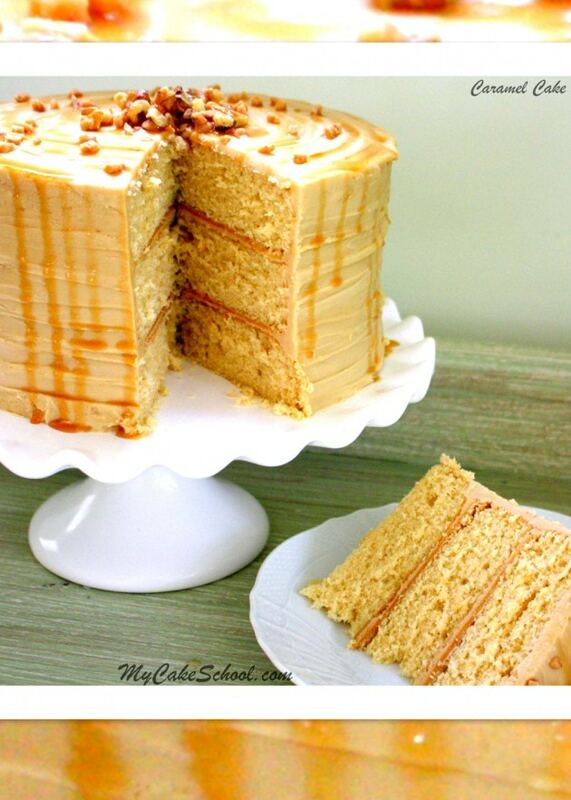 We’ve fallen in love with this flavorful cake, and the caramel frosting is just perfect! You are sure to fall in love with this moist and flavorful Caramel Cake recipe, and the frosting is fabulous! Preheat Oven to 350. Grease & flour three 8 inch pans. In a separate bowl combine the cake flour, baking powder and salt. Whisk at least 30 seconds to blend. Set aside. In another bowl combine the sour cream, vanilla, oil, and milk. Stir and set aside. In the bowl of your mixer add the butter that is still very cool and cut into 1/2 inch slices. Beat on low to medium speed until smooth and light, one to two minutes (longer if using hand mixer). Slowly add the white and brown sugar beating on MEDIUM speed until the mixture is lighter in color and fluffy, approximately 2 minutes (longer using a hand mixer). Add the eggs one at a time, mixing after each egg is added, just until it is blended in. Add the dry ingredients alternately with the wet ingredients beginning and ending with the dry ingredients. Scraping the bowl at least twice. Pour batter into 3 prepared cake pans and bake for 25 to 30 minutes. The cakes are done when a toothpick inserted into the center pulls out clean or with just a few crumbs attached. The cake also springs back when lightly touched. Heat the butter in a large saucepan until melted. Stir in the brown sugar, salt and whipping cream. Heat to boiling, stir constantly for 1 minute. Take off the heat and let cool. While still warm stir in the vanilla. *If you would like to drizzle caramel on the top of your cake, reserve 3 to 4 Tablespoons before moving to the next step. Slowly add the powdered sugar and stir until spreading consistency. You may not need to use all of the powdered sugar that the recipe calls for. This frosting becomes a bit more difficult to spread as it cools, so begin using while it is still somewhat warm. If the frosting becomes too thick, add cream a teaspoon at a time to thin. I like to use a hot spatula (slightly wet) to glide over any patches of frosting that need to be neatened up with a smooth finish. **Note that the caramel frosting is not the consistency of a typical buttercream frosting. It quickly develops a crust as it cools (though not at all grainy) and works best with textured designs rather than piped. However, I found that the crusted frosting smooths very easily with a hot (slightly dampened) spatula or even a Viva (no impressions) paper towel. We hope that you enjoy the recipe!! It is one of our fall favorites! Hi Manita- Are you making the Football Stadium, Football Helmet, or Soccer Ball Cake? Will you be covering with fondant? If it were me, I would go with ganache beneath the fondant. For spheres, I think the ganache really helps to hold things together. Good luck! Let us know if you have any more questions! thanks a ton melissa…..u have always been so prompt. Hi Louise, Yes, your salted caramel would be great to use with this cake recipe. Your cupcake looks delicious!! dose the cake itsself have a carmel flavor? Hi Sarah, the brown sugar that is used in the cake batter gives it a nice caramel flavor. Make sure to read Melissa’s note on the frosting because it does set up quickly. Superb!!!! I found this cake is not only beautiful but also it is very tasty. And it is very easy in making at home with the help of this article. Hi Sharon, I haven’t tried this but if using the WACS recipe, I think I would use 1/2 white sugar and 1/2 brown sugar. I think this would add a subtle caramel flavor. If you were using a white or yellow cake mix, I would also add a teaspoon of caramel extract. Since your cake mix is caramel I assume that the flavoring is in the mix. Thanks for your reply Bebe. It worked perfectly, very happy with the result. Sharon, Thanks so much for your post concerning brands that work for our recipes. Laura, A substitution that also works if you do not have cake flour is as follows: Using all purpose (plain) flour, for each cup of flour in the recipe remove 2 Tablespoon and replace with 2 Tablespoons of cornstarch. This recipe has 3 cups flour so measure out 3 cups of all purpose (plain) flour. Remove 6 Tablespoons and replace with 6 Tablespoons cornstarch and whisk to blend. Hi Marcela, Yes, you can. Carving is easier if the cake is partially frozen. Thanks , Melissa for the quick reply! I am wondering if you had the chance to read another question I posted last week about freezing cake. I posted in the almond sour cake from scratch, I think! Hi sujatha, If you do not have sour cream you can use yogurt, preferably greek yogurt. Hope you enjoy the recipe. Is this pipe able? I saw a cupcake above, but wasn’t sure if it was the same recipe. Hi Beth- I haven’t tried to do much piping with this recipe- I’ll make it soon and leave an update for you. This frosting does set up very quickly…the amount of powdered sugar could be reduced and would probably make it better for piping. I’ll let you know! I made this recipe and absolutely love the cake. It is moist and delicious. The frosting has a great taste but it’s a little too sweet but that may just be me.